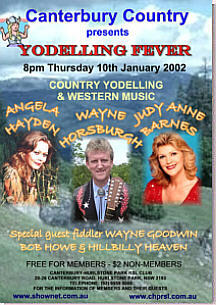 A continuing series of monthly Country Music shows that go under the banner of 'Canterbury Country'. 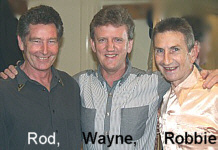 On the second Thursday of each month, 8pm at Canterbury-Hurlstone Park RSL Club. Check the main page to see who the guests will be each month, and make a regular date for some good music. Enjoy the photos below from the SECOND year of 'Canterbury Country'. In April a packed house enjoyed a great show when we went 'MOSTLY ACOUSTIC - a night of Country and Bluegrass' with the Sydney Album Launch of Blue Mountain Rain by KAREN LYNNE & MARTIN LOUIS, with ACOUSTIC SHOCK. 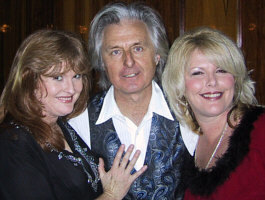 They were joined on harmony by Karen's sister Elizabeth Frencham, pictured right with brother-in-law Martin Louis. 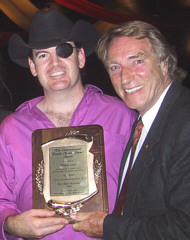 2002 FRANK IFIELD SPUR AWARD in association with The Galston Country Music Festival. The award was presented to Wayne Law. CLICK HERE for more information on the Award and photos...and CLICK HERE for sensational photos of the night by Terry Phillpot. to a huge audience. 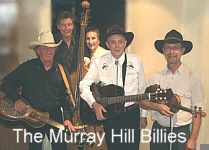 The show featured BROOKE LEAL, THE MURRAY HILL BILLIES (Murray Hill, Rod Coe, Robbie Souter, Gary Brown, Colin MacIntosh), BOB HOWE and the HILLBILLY HEAVEN Band, and many surprise guests direct from the Tamworth Festival! They included Peta Caswell, Bryen Willems and Wendy Costello, (Victorian Country Music Awards 2002 VICTORIAN MALE VOCALIST OF THE YEAR) Tim Wood, Teri St. Neil, Linda Maree Miller, Lee Forster, Wayne Horsburgh, Phil Cole, Les Scott and a special performance by the incredible Karen O'Shea. 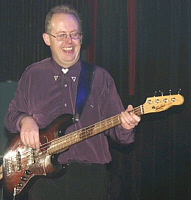 Thanks to Terry Phillpot (Eyeball Photographics) for this month's photos. Lots more photos HERE and HERE!! January 2002 - We started the New Year with a bang! 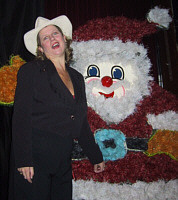 Pictured left: LESLIE AVRIL meets the man in the red suit. 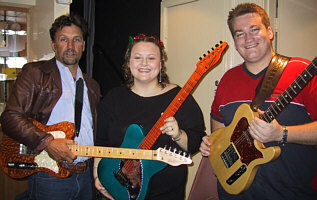 Below left: DALE JUNER, LYN BOWTELL and DUNCAN TOOMBS with their TOMKINS GUITARS. 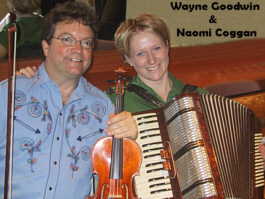 Below right: Joining in on the Christmas songs, Bryen Willems and Wendy Costello. 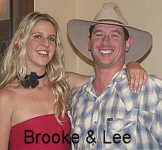 Listen for Bryen playing Country Music on Radio 2RRR-FM (Fridays 5-7pm and Sundays 6-8am). - Josh Canning, Ben Conicella, Dale Gardner, Chad Plane. 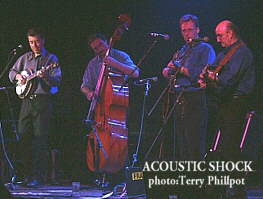 October 2001 - Canterbury Country - the TOMKINS GUITAR SHOWCASE. 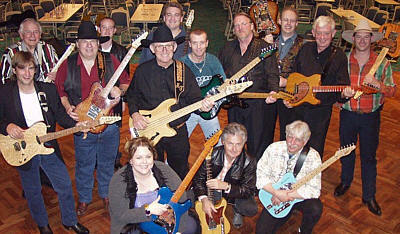 featuring (front row L to R) LYN BOWTELL, KEITH GLASS, JACK PLEDGE, (standing L to R) DWAYNE ELIX, GEOFF MACK, ALBY POOL, JOEL OAKHILL, ALLAN TOMKINS, DUNCAN TOOMBS, PAUL LINES, ALLAN CASWELL, BOB HOWE, MIKE MOORE, LEE FORSTER, (not pictured) MARY HEARD, LES SCOTT, DALE GARDNER, the Hillbilly Heaven band and lots of surprise guests. What a night! 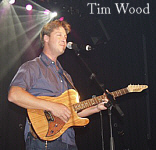 Check the TOMKINS GUITAR WEB SITE soon for more pics. 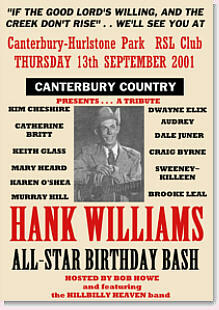 In September 2001, Canterbury Country presented 'The HANK WILLIAMS Birthday Bash' ...an all-star tribute to the legend. It featured KIM CHESHIRE, DWAYNE ELIX, KEITH GLASS, AUDREY AULD, CRAIG BYRNE, CATHERINE BRITT, BROOKE LEAL, MARY HEARD, KAREN O'SHEA, JOSH CANNING, MURRAY HILL, SWEENEY~KILLEEN, MERRIL PERERA, DALE JUNER and surprise guests Les Scott and Robbie Souter. 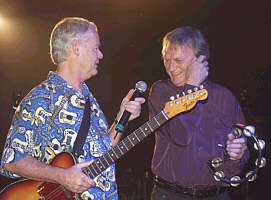 Music by Bob Howe & the Hillbilly Heaven band, with special guest fiddler, Wayne Goodwin (ex-Emmylou's Hot Band). 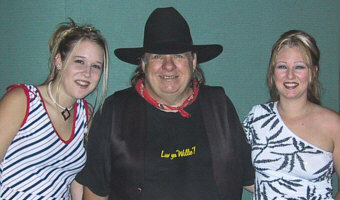 Special thanks to Universal Music for the Hank Williams CD prize giveaways, including the new Tribute album 'Timeless'. CLICK HERE for Photos and the Set List! AUGUST 2001:- DARCY LEYEAR is the vocalist for a great Australian Country band who were blitzing the ARIA pop charts at the time. 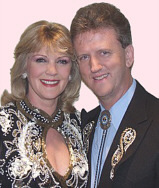 PRU CLEARWATER can often be seen presenting a tribute to an International Country star. 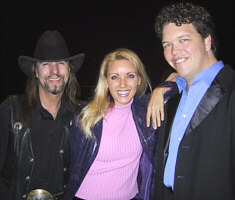 DANIEL THOMPSON is half of the popular duo 'Rustic Soul'. 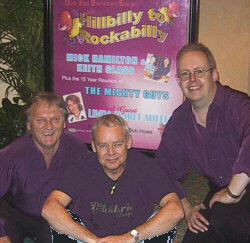 In AUGUST we saw DARCY, PRU and DANIEL (pictured right) performing in their own right, and deputising on bass, on loan from the Bushwackers (pictured left) Roger Corbett. July was the time for GORGEOUS GIRLS WITH GOLDEN GUITAR! 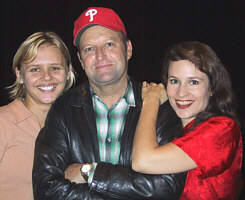 Yes, Vocal Duo of the Year THE CROSBY SISTERS hit 'Canterbury Country'. 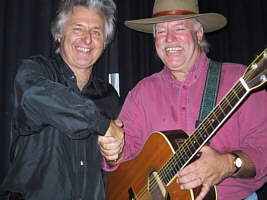 Also making a featured appearance was KEITH GLASS, who launched his brand new album 'Australian Soul' and sang some of his Country chart hits! 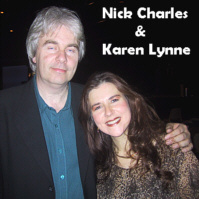 Click on the album cover to find out more and order your copy NOW! 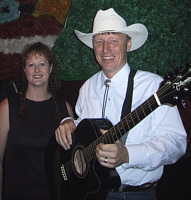 We were also treated to a surprise vocal visit by Peta Caswell and deputising on bass, on loan from the Slim Dusty band, Mr Rod Coe. The June show starred, from left to right, rising star Camille Te Nahu, and the welcome return of Brent Parlane, performing songs from his new album 'Good Man Down' which was produced by Nash Chambers. Completing the line-up, and riding high on the International success of her album 'The Fallen', was Audrey. It was 'back by popular demand' for Audrey too, who was the star of the very first 'Canterbury Country' show! 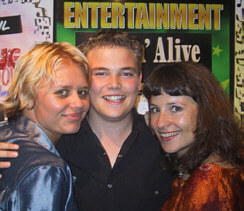 The May 2001 show was our first birthday! 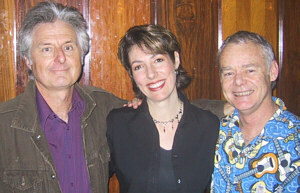 Starring on that night were Craig Giles and Raebekah Roycroft (above left), and Doug Rowe, pictured above right with guitar, renewing a 30 year old acquaintance with Keith Glass. 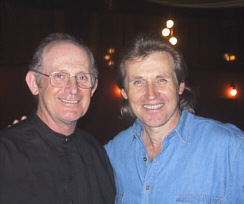 Although both now ensconced in the Country Music scene, in former lives as Aussie rockers, Doug was a member of Flying Circus, while Keith was in Campact. Where did all the other photos go...?